Accurate and efficient, the X-ACTO Commercial Grade Guillotine Trimmer cuts high volumes of paper with ease. With the ability to cut up to 20 pages at once, this trimmer creates quick and accurate cuts to paper of all sizes. 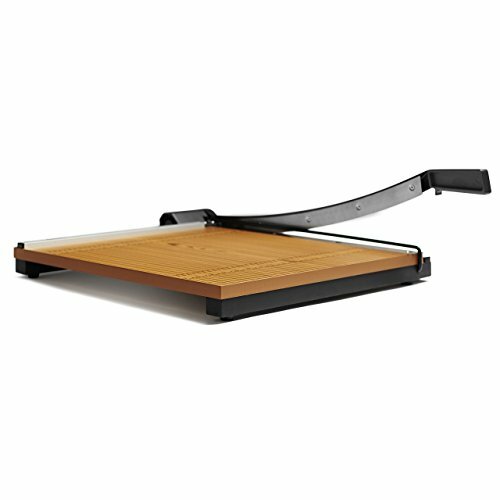 Designed for school and office settings, this trimmer features a solid wood base for steady cutting. The Perpetual Edge self-sharpening system keeps the blade sharp for clean cuts every time, while the safety guide and safety latch protect users during use. This X-ACTO trimmer is a durable and dependable precision cutting tool for workers, educators, and students alike. If you have any questions about this product by X-Acto, contact us by completing and submitting the form below. If you are looking for a specif part number, please include it with your message. Harvy Canes - Ceremonial Scissors - Gold - 12"